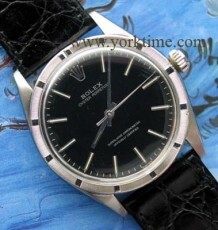 Very early Rolex President ref 6612 Day Date with original papers and timing certificate. All original watch with smooth bezel and original eggshell texture dial. 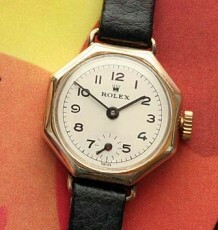 This early vintage Rolex watch is one of the earliest Day Date or President models I have come across. The watch features the rarer reference number 6612 signifying that is uses a smooth gold bezel instead of the more frequently seen fluted bezel. 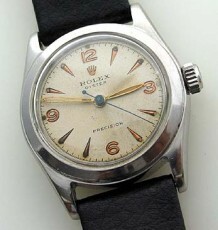 The watch is in outstanding condition with only a slight patina to the dial which is visible in the photos. Also note the eggshell texture to the all original dial. 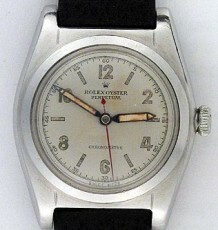 The previous owner had the watch serviced at Rolex in 2008 and a copy of the service receipt is enclosed with the watch. 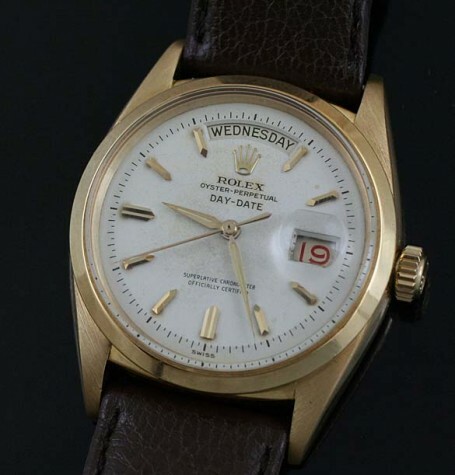 Vintage watch collectors will be amazed to learn that the watch comes with teh original papers, directions for use as well as the original timing certificate documenting the movement’s Chronometer testing prior to assembly of the watch at Rolex Bienne. The white dial of the watch is accented with gold arrowhead markers and the original pointed dauphine hands. Also unusual is the red date wheel used in the early days of production of this rare and complete watch. The watch is supplied on a genuine Rolex leather strap with gold-filled Rolex buckle, as was common when these watches were first introduced. The watch case is the same 36 mm width as subsequent Day Date models.